With its original setting and the glorious costumes of 17th century France, this classic romantic comedy has been given a 21st century snappy modern adaptation. 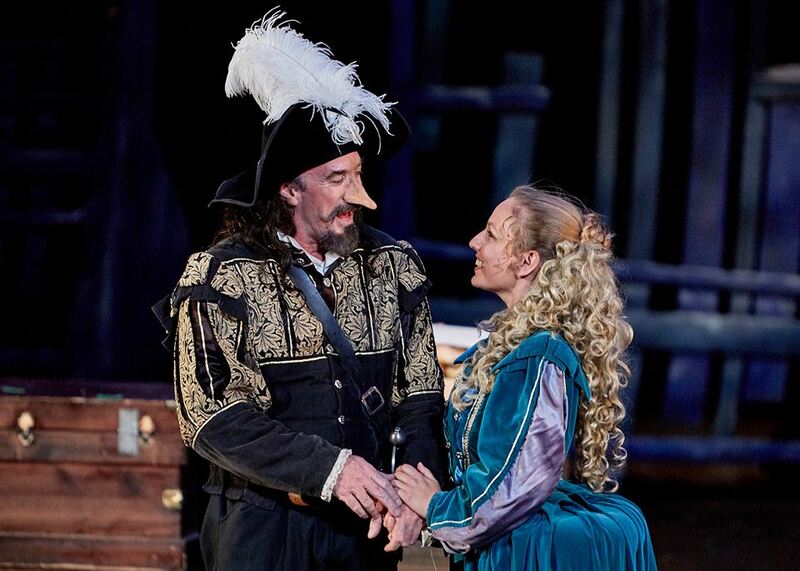 Cyrano tells the story of a great swordsman with a beautiful soul, who is hampered by a huge nose that makes him believe he is incapable of being loved by the beautiful Roxane. When he learns that Roxane and a handsome young soldier named Christian are infatuated with each other, he writes beautiful love letters for her suitor that lead to a calamitous love triangle. An ensemble cast of nine actors brings a rollicking theatricality to this epic tale. Filled with swordplay, romance and amped-up humor, this is the funniest Cyrano you will ever see! IT’S INTERESTING the way that PacRep’s current season takes two central heroes of early 20th century European drama, Peter Pan and Cyrano de Bergerac, and gives them each a new look. Plus the frank theatricality of a handful of actors playing a whole lot of the characters involved in the stories of their lives. In the June/July production of Peter and the Starcatcher twelve actors played more than 30 roles in a swashbuckling prequel to the August/July musical version of Peter Pan. Now there’s an exciting new version of Cyrano, which tells the well-loved tale but pares nearly 50 speaking roles down to 27 to be played by a cast of nine. When you think about it, Peter and Cyrano are cut from the same mold. Both are chock full of swaggering self-confidence, both are supernaturally brilliant swordsmen, both are sworn enemies of the social status quo. “I want,” Cyrano explains at one point, “to reduce the number of bows I have to make in a day.” Peter doesn’t want to grow up and have to make that kind of decision in the first place. Like many another theater addict of my generation, I’ve always loved Rostand’s three hour, five-act marathon of moonlit romance, spontaneous poetry and dashing swordplay. But Michael Hollinger’s slick new translation and the fresh two-act adaptation of the text he shares with Aaron Posner make for a fast-paced and thoroughly satisfying evening in the Outdoor Forest Theater. So there’s little left of Rostand’s blank verse or the sections of social comment on French society of the 1600’s. What comes across vividly is the central ironic dilemma of a man with a face so unsightly he can only use his supreme genius for poetic love talk to push his lady love into the arms of a handsome but tongue-tied rival. Pacific Rep executive director Stephen Moorer is an active, touching and consistently funny Cyrano. He mines every vein of wit in the new script and catches most of the underlying pathos without ever slipping into the lilting Gielgud/Burton attitude and voice adopted by some Cyranos I’ve seen. His dying attack against social convention and phony officialdom is no reflective elegy, it’s a ruthless sword fight to the death. This new version makes it easier to explore character motivations and navigate some of the finer points of 17th century French civic and military life by expanding the role of Le Bret. He’s no longer just Cyrano’s trusty military buddy; he’s a wise narrator who steps out of the action and into a spotlight to explain things directly to us ticket holders. It works admirably. Unlike Rostand’s audience but just like Shakespeare’s, we’ve reached a point where we like it when somebody pauses the story and comments on what’s going on. As always, Jeffrey T Heyer is clear and believable in the role. The remainder of the players are busy and excellent, moving nimbly through two or three roles apiece. Jennifer Le Blanc is a beautiful, passionate Roxane, so swept up in a duet of Cyrano’s poetry and Gascon-cadet Christian de Neuvillette’s good looks that it takes her fourteen years to discover she’s been in love with the soul of one and only the body of the other. Justin Gordon is an appealing Christian, a fresh military recruit who’s closely in touch with his feelings but clueless in expressing them. I liked his last-minute wide-eyed explosion of terror at having to woo the lovely Roxane, even coached by the eloquent Cyrano. D Scott McQuiston is a bubbly and comically endearing Ragueneau, a pastry chef and would-be poet, who manages (in the interest of trimming down cast size) to shout protests at his wife for wrapping her pastries in the texts of his verses without her ever actually appearing on stage. A small and energetic Andrew Mazer is convincingly tipsy as a bibulous cadet named Ligniere. Lewis Rhames is willowy and comically inept as a plumed Parisian popinjay named De Valvert, one of a string of candidates for the hand of the fair Roxane. 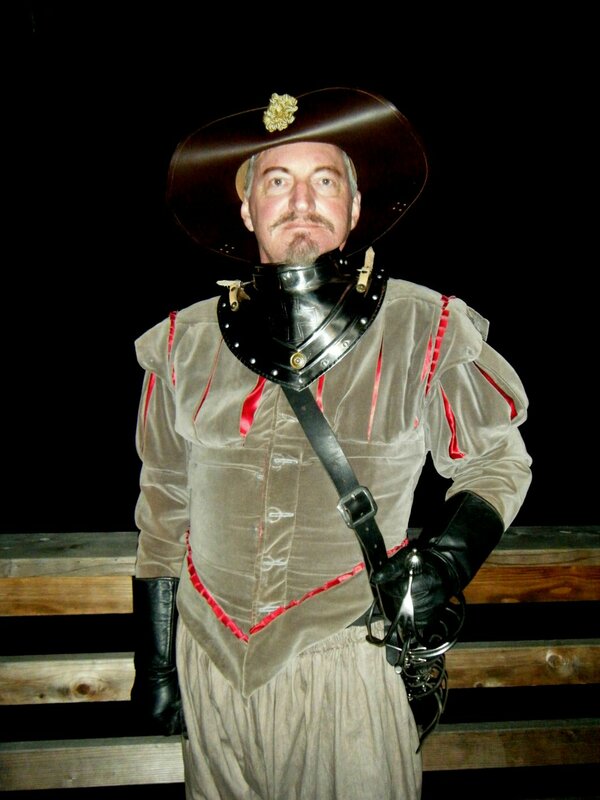 More purposeful and pompous is Michael Storm as another suitor, De Guiche, commander of Cyrano and Christian’s Gascon battalion. The versatile and surprising Garland Thompson moves effortlessly through five different roles, most notably in drag as Roxane’s busybody and sweet-toothed duenna and then in Rosary and wimple as the chatty, broom-wielding Sister Marthe. Kenneth Kelleher’s direction manages, again and again, to make the nine-member cast look and act like a big crowd. My favorite segment of Act 1 is a sequence that doesn’t even happen in the old Rostand version. Cyrano, high and happy at some fond attention from his beloved Roxane, learns that a hundred sword-wielding thugs are planning a midnight ambush at the Porte de Nesle. He vows to bare his sword and carve them up, single handedly, one by one. Rostand’s script simply reports his success after the fact. Kelleher, Moorer and fight director Justin Gordon show it happening in a shadowy ballet of flashing swordplay which proves that perfectly timed farce can be both hilarious and beautiful. I loved the show, but I had minor problems with the set design. The big outdoor theater stage allows for a lot of depth and width. But is the backstage area so limited that ingredients of Patrick McEvoy’s settings need to be stored in plain view instead of waiting in the wings to be wheeled on when required? The big quarter moon awaited its appearance in the balcony/garden scene from a position way upstage. And an unchanging background of blue-green wooden fretwork units gave a sense of clutter. That said, it’s a must see, but take plenty of coats and blankets. It continues through October 15th. 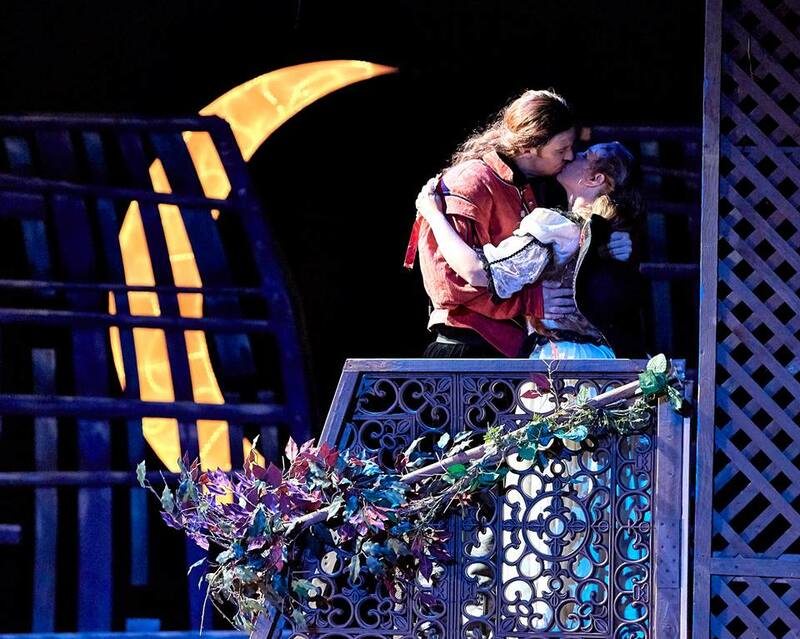 At Carmel’s historic Outdoor Forest Theater, when Stephen Moorer as Cyrano de Bergerac pays poetic homage to the moon, there it is shining brightly through the pines right on cue. A treasure of our region, this unique theater company delivers pure enchantment to audiences on clear nights under a moonlit sky with its stage-side fires crackling cheerfully. 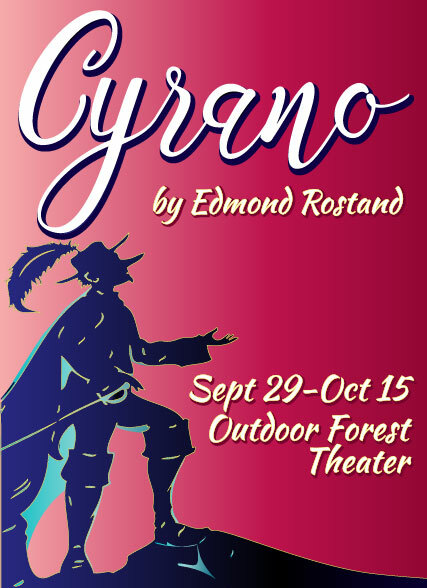 Returning to the Forest Theater this season is Edmond Rostand’s Cyrano, that beloved poetical swashbuckling soldier, lover and tragic hero, with his rapier wit and nimble rapier. This season Pacific Repertory Theatre stages a more comically entertaining adaptation of Rostand’s classic crafted by Michael Hollinger and Aaron Posner. Directed by Kenneth Kelleher and featuring Moorer, PacRep’s founder and executive director, in the title role, this production of the French masterpiece suits PacRep’s fondness for broad humor and contemporary takes on theater classics. Cyrano, like Hamlet, is a coveted role for many actors, one that demands skill, energy, heart and charisma. It’s a theatrical Everest of sorts that provides a virtuoso showcase for accomplished artists. This Hollinger/Posner version fits Moorer well, allowing him plenty of knockabout comedy to enjoy alongside the deep dive into the pathos and suffering of this complex character. He does both with Cyrano-style panache and gives a heartrendingly moving performance in the final scene. 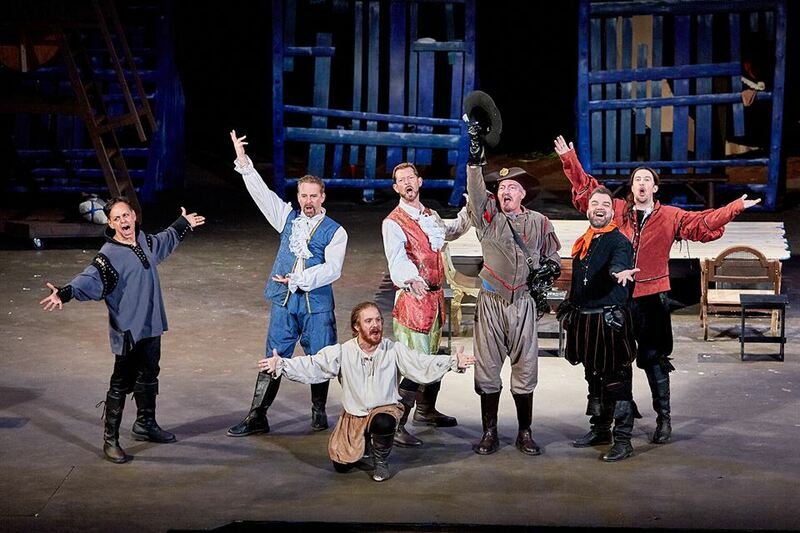 A significant accomplishment of this Cyrano is its lean, budget-smart reduction of cast members to nine actors, eight of whom take on two or more roles. And though still a full evening of theater, the play has been recrafted from five acts to two, deftly utilizing the figure of Cyrano’s closest friend Le Bret as a narrator. The dialogue is modern and direct, not constrained by the need to translate the poetic verse of the original. Hollinger writes that he wanted the language to be “very immediate, rhythmic, and lively, and that its poeticism should feel more like slam poetry, with more interplay of sounds within and between lines than end rhymes, than the predictability of the 17th-century-verse plays Rostand was emulating.” And thus it is. The play remains set in the original period of 17th-century France, recounting the tale of this genius intellect, brilliant swordsman and passionate soul, whose tragedy is a facial anomaly that separates him from the love of his beautiful and cultured Roxane (Jennifer LeBlanc), who is smitten by the good-looking but bumbling Christian (Justin Gordon). The plot turns on a deception in which the two men woo Roxane together, one with beautiful words and the other with a handsome appearance. Jeffrey Heyer gives an intelligent and sagacious performance as Le Bret, Cyrano’s loyal friend and protector. He anchors the production with authority both as Le Bret and as the narrator. LeBlanc makes a coquettish and appealing Roxane in the early scenes, and transmits the character’s inner beauty and warmth fully in the final scene. Gordon as Christian is a perfect lovesick dolt. He and Moorer make an ideal pair of obsessed fools in the crazy love scenes under Roxanne’s balcony. Gordon also choreographs the swordplay to good effect in the famous duel wherein Cyrano defeats his opponent while making up metered verse and later on when he vanquishes 100 ambushing swordsmen one by one. This agile ensemble also includes Andrew Mazer’s righteously drunken portrayal of cadet Ligniere; D. Scott McQuiston is a charmer as Regeneau, the poetry-obsessed pastry chef, who wraps his tartlets and eclairs in verse-texted paper. He also appears as the rotund hack actor Montfleury, who Cyrano bans from the stage. Lewis Rhames makes a foppish appearance as De Valvert, suitor to Roxane, whose arrogance gets him trounced by Cyrano’s sword. Michael Storm is a strong and menacing De Guiche, commander of the Gascon unit of the regiment where Cyrano and Christian serve. Garland Thompson amusingly bends genders as Roxane’s overprotective duenna and a nun, among other roles. Abra Berman’s costumes define the action brightly in the 17th century. The scenic design, however, was disappointing, especially as it featured very identifiable large curved structures from PacRep’s Peter Pan musical’s shipwreck sets earlier this season. Did you think we wouldn’t notice? The production benefits from an excellent score composed by David C. Eakin as well as a fine musical mix from the Baroque era and Age of Elegance that warms the air before the show begins. Remember, as always, to dress warmly, bring blankets and cushion comfort for the hard benches, and enjoy this quintessential Carmel experience.